How do I work my magic? For exterior paint correction of scratches, and a dull finish, a heavy duty machine polisher is required, of which I have 5. 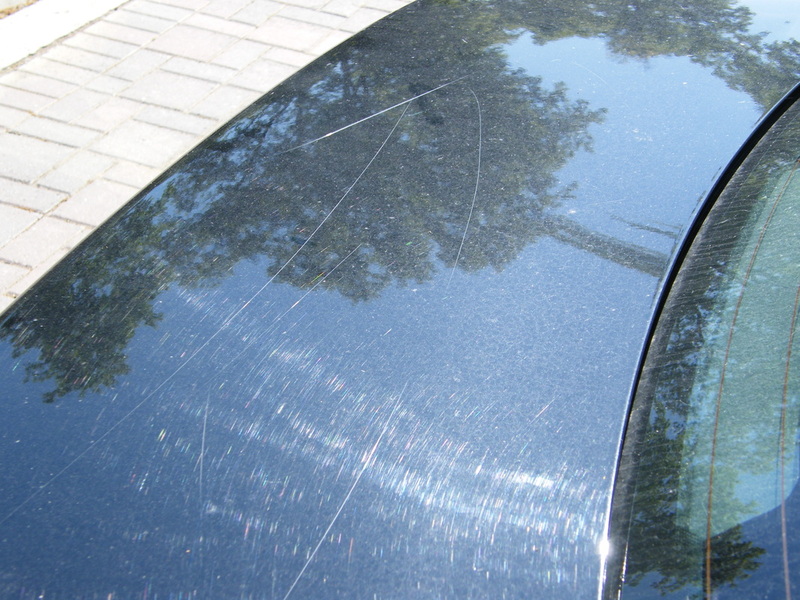 A good detailer will use the correct tool for the kind of paint that is being corrected. "Before" shots on a 2002 Jetta. Note the dull finish and scratched surface. In well trained hands a heavy duty polisher in combination with the right choice of product and buffing pads can restore the paint to its former glory with a mile-deep reflection and gloss. I am also trained in wet sanding and chemical leveling of paint to even out scratches. As you can see by the ’02 Jetta displayed in the previous picture, the turnaround can be quite dramatic. The process used to revive the paint is a strong wash using a foam wash to loosen any stubborn dirt and debris from the surface. 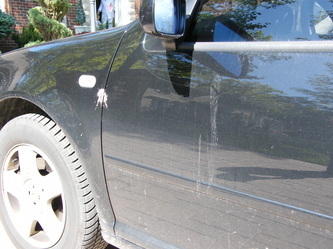 Then the surface is washed again with the least amount of friction possible to protect against further damage. Only the finest soap with a high degree of lubricity is used to achieve this goal. After the wash comes the clay bar defect removal. 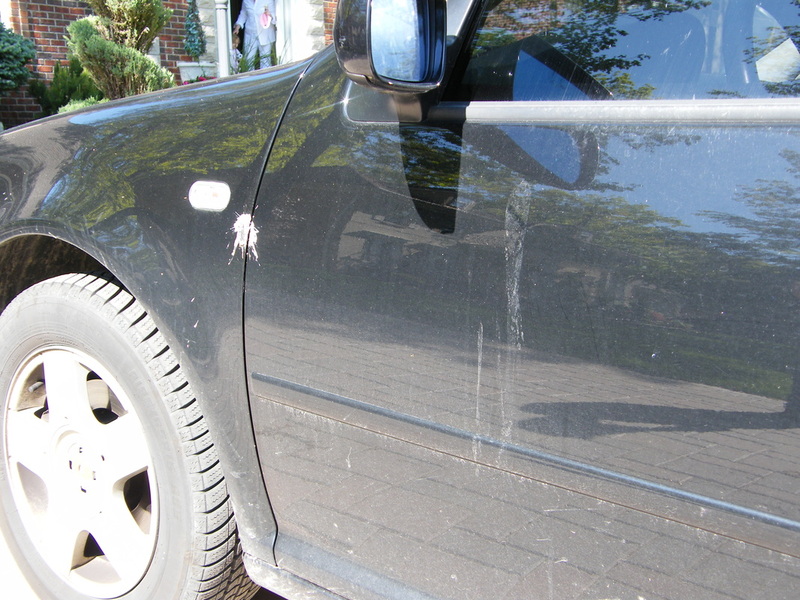 The clay bar removes contaminants such as atmospheric fallout, rail dust, acid rain, tree sap, paint over spray, etc. This is a very effective tool to smooth out the paint finish. The smoother the finish, the better the shine and the reflection. It also helps the products penetrate the paint. Now the paint is ready for compounding or polishing. The clear coat on many vehicles is only about as thick as twice the thickness of a cellophane wrapper of a package of cigarettes. It's most accurately measured in microns, which is one thousandth of a millimeter. I have an electronic gauge to accurately measure and monitor how much clear coat there is there to begin with and how much correction can SAFELY be done. The wheels of a vehicle become very dirty over time due to the brake dust generated by the friction of the brake pads and rotors. This hard to remove dust will adhere to the surface of the wheel and will detract greatly from the appearance. In some cases, the customer requests to have the wheels removed so the inner barrels can be cleaned to perfection and then sealed with a nano coating. The calipers are also given this special treatment. The inner wells are made to look 'factory new' again with this unfettered access. I have a torque wrench to assure factory specifications are followed for the re-torquing of the wheels. The wheels are cleaned to remove the brake dust and then polished to the best of their ability. A stunning set of wheels can really capture a car's impact if they look their very best! The Special Services page lists details of what I can do to improve your vehicle's headlights as well as scratch repair to the paint and a new cutting-edge protection available as well. Click on the "Special Services" banner to see the drop-down menu. Next, please join me to see the fruits of my labour with some before and after shots of vehicles I have detailed in 3 galleries HERE.